Located off the north west coast of Lombok and just a short journey from Bali, the Gilis are comprised of three enchanting islands. Views over white coral beaches present delightful vistas of Gili Meno, Gili Trawangan and the Bali hinterland, with the iconic Mount Agung creating a picturesque backdrop for spectacular sunsets. On the west side of Gili Air you will find a compelling blend of luxury, relaxation and service excellence for a unique paradise experience. Grand Sunset offers 25 comfortable rooms, a spectacular restaurant, an on-site dive school and infinity swimming pool. Our concierge service makes it easy to plan your itinerary and ensures that you’re stay is brimming with activities that will suit any type of traveller. If you’re looking for a remote tropical island getaway, paradise awaits at Grand Sunset Gili Air. Three islands make up the Gilis, each with its own unique character and atmosphere. 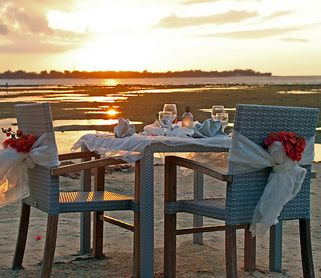 Gili Trawangan is the most cosmopolitan of the trio of islands, with upscale dining and parties aplenty. Gili Meno is typified by an abundance of pristine stretches of quiet and unspoilt beach, while Gili Air is a blissful blend of Gili Trawangan and Gili Meno, with an ideal proximity close to the mainland. Gili Air is also the location of the Grand Sunset. The friendly staff at the Grand Sunset Gili Air eagerly await your arrival, and look forward to welcoming you to an island excursion like no other.